It is cheap, cheerful and functional. It may sound like there are sacrifices but the performance and build quality are as good as any brush three times the price. There is no arguing that this is a good electric toothbrush for the majority and you are not wasting money if you buy one. However, as good as it is, the Oral-B Pro 2 2500 is, for many a better buy. The Oral-B Pro 2 2500 is pricier it is, but it brings more cleaning power, double the battery life, extra cleaning modes and a pressure sensor. If you are short of time, the answers to the following 3 questions should let you know all you need to about the Oral-B Pro 600 (view on Amazon). If we have missed something, let us know in the comments. If you want more detail, you can read our full Oral B Pro 600 review further down the page or watch our video review. You may also like to check out our Pro 650 Review. No, it is a good brush for the money. As good as the Pro 600 is, the Fairwill FW-917 is a better buy if you are on a budget. It gives you quite a bit more, for a similar price. The downside here is Fairywill does not have the same reputation as Oral-B. If you can stretch the budget a bit, it is our recommendation to go for the Oral-B Pro 2 2500. The brush itself a little more powerful, so it, in theory, can clean better. It offers double the battery life, comes with a pressure sensor built in to stop you brushing too hard, and has a travel case too. For more advice you may like to read our best electric toothbrush post. 3. Where’s the best place to buy the Pro 600? Typically we tend to recommend Amazon because it is very competitive on price and often has special offers running. It also offers free delivery. However, it’s always worth checking out other retailers as well. 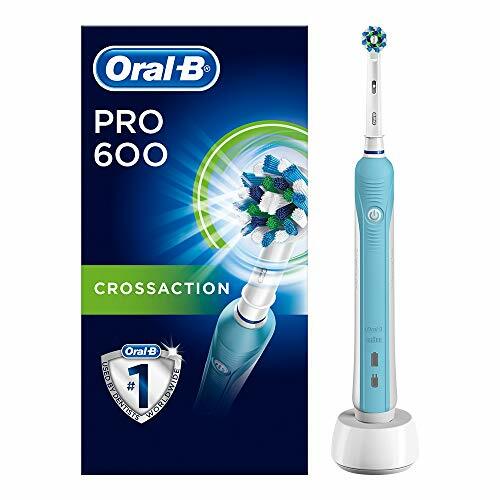 Check the links below for the cheapest price for the Oral-B Pro 600 amongst UK retailers. It’s always worth checking eBay too. This is the entry level brush within the Pro Series from Oral-B that offers superb value for money and a no nonsense approach. The Pro 600 is about getting the job done simply and effectively without the hassle. If you have sensitive teeth or gums or more advanced dental needs the Pro 600 is not an ideal option but it is well suited to the average user. 1 cleaning mode – Daily clean is generally the ‘go to’ mode for most users even on more premium brushes with other modes used less frequently. This makes it easy and simple to get up and running. A slim profile – The Pro 600 is an easy to use brush that fits comfortably in the hand irrespective of your age and movement in your fingers. Well designed contours and rubber grip stop the brush from slipping when wet. Price – The limited box contents and features allow this to be offered at a competitive price. 1 Cleaning Mode – The lack of additional cleaning modes means that this may not be ideal for everyone. 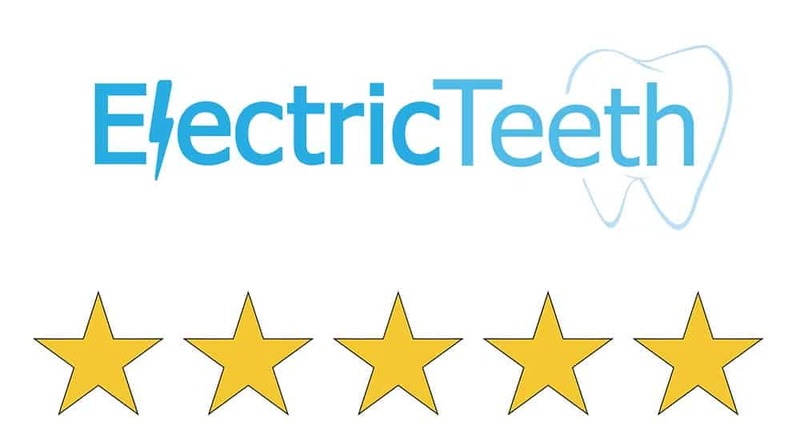 Battery Life – Up to 7 days life or 28 minutes of usage time which is weak in comparison to a Philips Sonicare brush such as the HX6511/50 which can last up to 3 weeks. Limited box contents – You do not get much in the box, no travel case or brush head storage compartment. What always impresses me about the Pro series from Oral B is that the design and size of the brush handles are such that most people from a child right through to pensioner with limited movement in the hand can normally comfortably hold, grip and use the brush. More expensive models like the Pro 6000 and 6500 are a bit of an exception to this rule, but the Pro 600 we have been testing keeps this universally acceptable design and form factor. Weighing in at 130g and no more than 3cm thick the handle fits comfortably in the palm of the hand and a mixture of rubber and plastic grips make for easy grip of the brush even when wet. The Pro 600 has a length of baby blue coloured rubbers that runs down the front of the brush. It makes it look a little less clinical, in comparison to an all white option. The rear is constructed from a rigid, gloss white plastic with grips running down from the top to the bottom. Whilst functional using rubber here would be nice as it would feel even better and look more premium. The raised power button is what starts and stops the one cleaning mode on this brush. A tactile button that sits prominently in the upper third of the brush handle it is not only very visible thanks to white accents, above and below are a series of contoured grips in the rubber to ensure it remains in the hand. Once the power button has been activated the Daily Clean mode will begin. You should perform a 2 minute clean at least twice a day (remember to clean interdentally at least once too). During the 2 minute cleaning cycle the brush will provide an audible warning via a slight pause in the brushing at 30 second intervals to tell you to change quadrant. There are 4 quadrants to the mouth. You spend 30 seconds on each quadrant and at the end of the 120 seconds or 2 minutes another audible tone is heard to signify the end of the cycle. The brush continues to operate at the end of the cycle unless you turn it off. A common mistake particularly when using a manual brush is applying too much pressure. The bristles of the brush should virtually skim the surfaces of the teeth. Some brushes have a pressure sensor built in. The Pro 600 does not, but what is important to know is that even when applying too much pressure the speed of the brush head is automatically adjusted to ensure that minimal damage is done. You should be able to hear the brush motor sound change if you are applying too much pressure. Whilst the Pro 600 brush handle itself remains consistent (although you may find a pink rubber in some places), there are some slightly different package contents options when it comes to the brush heads included. Generally speaking, there is only 1 brush head included. Most common is the Cross Action brush head but there are packages that contain a 3D White or Floss Action head. What you choose is a personal decision and you will likely need to try each or seek advice from your dentist on which is best for you. The more common CrossAction brush head has hundreds of bristles that are angled at different directions. Scientifically engineered, the Cross Action head aims to ensure the bristles cross over different parts of the tooth surface more effectively than those bristles that are straight and not angled. This does not necessarily mean the Cross Action brush head is better, it is just different and will suit some more than others. Remember to change your brush head at least once every 3 months. Set a reminder on your phone, in your diary or just check your brush head regularly. You will notice that the bristles will actually change colour and fade as they get older and are used more. If you have not changed your brush head for a while and the bristles look a bit faded, it is probably about time. With any of the Pro Series, the brush heads are interchangeable so you can pick up alternatives if you prefer. Thus if it came with a Cross Action brush head you need not stick with it. By their very nature, a toothbrush will get wet. The Pro 600 is fully water resistant. Whilst leaving it at the bottom of a bath might not be the best idea, you can use the brush in the shower if you like without issue and running tap water over it is just fine to keep it clean. Another little feature which is not marketed at all by Oral B on the Pro 600 is the ‘Sound Connectivity’ feature. What you need to do is download the Oral-B app onto your iOS or Android device from the App Store. It is simply called ‘Oral-B App’. Once installed go into the app settings and make sure in the that ‘Toothbrush Sound Recognition’ is switched on. The app is engineered primarily for the more premium Smart Series brushes (Pro 6000 & 6500), which the 600 is not a part of. If you are really keen on logging your toothbrush activities then this has some benefit. It may be more interactive for children, as it does have some nice graphics; but the whole process feels like a bit of a hassle. The logging is a way of changing brushing habits and acting as an educator and tool to improve oral health care but the Bluetooth connectivity on the Pro 6000 and 6500 is more reliable and the brushes can retain data so you do not have to open the app every time you brush your teeth. As standard, a 24 month warranty is provided with the Pro 600, but register the brush online and you get an extra 12 months at no extra cost, so 36 months or 3 years in total. 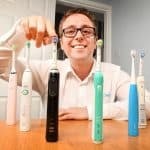 What you expect in terms of battery life from a toothbrush may different from what someone else expects, but generally speaking, a common battery life is around a week, based on one user, making use of the brush twice a day for a total of four minutes. The Pro 600 is no exception offering up to 14 cleans or 28 minutes of usage time. If you clean your teeth more than twice a day expect the number of days usage time to be less. Oral B could have increased the battery life but it would have made the brush thicker and heavier like their premium models. I do believe this usage time is acceptable. However, Philips electric toothbrushes generally offer a battery life of up to 3 weeks from what is only a marginally thicker brush handle. The battery technology used is slightly different. Sadly a lovely feature Philips offer is not yet available on Oral B brushes. That is where it automatically powers off at the end of a 2 minute cycle. In the box when you buy the brush is a fairly basic but functional charging station. The small prong on the top marries up with a recess in the bottom of the brush handle and will charge the brush fully in about 8-12 hours. I tend to leave it on charge overnight. When charging the battery charging icon flashes green. Connect this charger to the 2 pin socket in the bathroom. If you do not have one, purchase an adapter and you can use with conventional 3 pin mains in the UK. The charger does work on 220-240v. If you share the brush handle (remember not to share brush heads) then you may want to leave the brush constantly connected to the dock when not in use to keep the battery topped up. Do remember constantly being sat on the charger can reduce the working life of the battery, but doing so does not invalidate the warranty. To prolong the battery life it is good to run down the battery life completely occasionally. The Pro 600 has a recommended retail price of £49.99. You should be able to source at generally speaking 30-50% lower than this. We recommend checking out Amazon as they often have deals running, but it’s also worth checking other retailers before you buy. It’s always worth checking eBay too. At the time of writing prices varied from full RRP down to around £25 with most coming in and around £30. We purchased our model for just £25. Using the average cost (based on one user) and ownership over 3 years (the same as the warranty period), the Pro 600 will cost £59 or just 5p per day to own. However, you can consider the Fairywill FW-917, which works out at just 4p per day, but gives you a few more features and box contents. Having been using Oral-B brushes for many years personally along with having put many through extensive tests we can be pretty confident that your brush will still be functional 4 or 5 years down the line. With a regular rinse and wipe down the brush will stand the test of time. Plastics and rubber may start to discolour but you should not really expect failure. The weakest point is the battery. After this time this is most likely to fail due to the constant charge and discharge and internal parts could wear out but anything beyond three years and you are doing well. Remember, register your brush online to get a 3 year warranty, which is better than most would expect and gives you added peace of mind. Is the Pro 600 an oscillating brush? No, it has just one cleaning mode Daily Clean. For more cleaning modes consider the Pro 2000, 3000, 4000, 5000 or 6000. The brush head that is supplied will depend on the version purchase. The Pro 600 is sold with a Cross Action, Floss Action or 3D White head option in the box. Irrespective of which one you purchase you can change the heads with any others on offer from Oral-B. There are many that work with the brush handle. There are 6 main brush head options that include Cross Action, Floss Action, 3D White, Sensitive, Precision Clean and TriZone. Does the Pro 600 have Bluetooth? Does the Pro 600 have sound connectivity? Does the Pro 600 come with a warranty & how long is it? If purchased new from an approved retailer the Pro 600 will come with a 2 year warranty which can be extended by a further year to 3 in total if you register the brush online on Oral-B’s website. Does the Pro 600 have a built in timer? No, the Pro 600 does not have a wireless smart guide included. Consider the Pro 5000 for this. Yes, a charging station is included with the Pro 600. The Pro 600 charging station or brush head holder has not been designed to be fixed to a wall. Can I use the Pro 600 in the shower? No, a travel case is not included..
Do you own or have you used the Oral-B Pro 600? Thanks for the comment. As we point out in our article ‘Charging an Electric Toothbrush‘, the Pro 600 will take up to 16 hours to charge. Sounds like something could be wrong with the brush/charger you have. How many ROTATIONS per minute does the Oral B Pro 600 have? The Pro 600 has 8,800 oscillations and 20,0000 pulsations per minute. Whats the recommended age for this? Can i get it for my 8 year old? Yes Tasha, this is perfectly fine for an 8 year old. This could work for a 6 year old yes. To be honest with you, 6 years old is the youngest age for a child to use this with due to the size of the brush head. Even for some 6 year old’s the brush head might well be a bit big. I would also encourage getting a sensitive brush head, as this will be more gentle on the childs teeth and gums. You may want to consider the Oral-B Pro 2 2000 which has the benefit of a pressure sensor, so you can help teach the child not to brush with too much pressure. Ok. I bought this for my other half from Home Bargains last week. Charging it up fully took 27+hrs. Used twice a day, it has lasted 3 days & has been back on charge for the past 15hrs & is still flashing green. My Philips Sonicare lasts for 3-4 weeks b4 it needs charging & that only takes 12hrs. This will be going back to the store for a full refund. Sorry to hear this Gaz. It should be lasting about 7 days based on 2 x 2 minute cleans a day. Is your partner brushing for longer than 4 minutes in total a day which could affect it? Currerntly £19.97 on Boots web site. Don’t know if it is the same in store. How many pulsations per minute does the Oral B Pro 600 have? Hi Charlie, it has 8,800 oscillations per min and 20,000 gentle pulsating movements per minute. It only has one standard brushing mode so operates at these specifications whenever in use. It used to be easy to research if the actual motor used in the various models provided the same oscillations. Do you have any information comparing this? The Pro 600 has 8,800 oscillations per min and 20,000 gentle pulsating movements per minute. It only has one standard brushing mode so operates at these specifications whenever in use. The next step up from this would be the Pro 2000, this is the first standard full power one in the Oral-B range. It has the same 8,800 oscillations as the 600 but has 40,000 pulsations so is slightly more powerful. The brushes in the range above this continue with this same oscillation and pulsation count until you get to the top of the range Genius models which offer the most powerful 10500 rotations and 48000 pulsations per minute. Can the charging base of the Oral-B Pro 600 be used to charge the Oral-B Pro 6500? Are the charging bases identical? Hi Howard. Yes you can use the same charger. We do not have an original boxed unit of each to give 100% confirmation that they are identical but we are 99% sure that they are.